The Matrix gauge set is intended to operate on Mercury SmartCraft® or NMEA 2000® engines (max 4 engines / 2 stations). 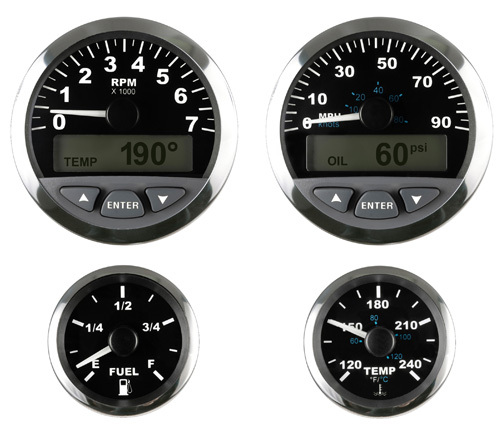 The gauges operate on 12v systems and support single, dual, triple or quad engine applications. In a Matrix gauge set, the 3” tachometer is the master and connects directly to the data bus. All other gauges are slaves and connect to the tachometer RS-485 private bus (immune to electrical noise, more robust and reliable). The tachometer reads engine parameters and forwards them on to the slave gauges.